The UI VOIspeed allows each user to add up to 4 communication devices, including a mobile phone. In order for a device to be linked with a specific user, it must be set to authenticate on the PBX with the user’s account (user name and password). 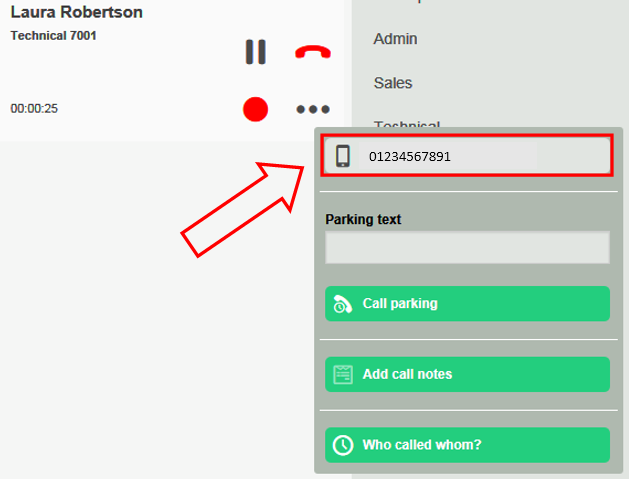 To link a mobile phone instead the PBX administrator only needs to enter the phone number in the user’s profile and activate it in the GUI. The user must specify the default device that will be used for outgoing calls. To do this, select the specific device with a click from the list of available devices shown in the GUI. 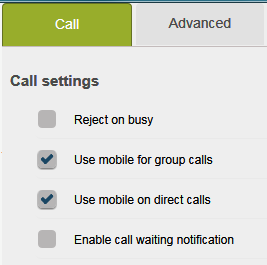 By default, all the devices linked to the user will ring at the same time as a call arrives, except for the mobile phone for which it is possible to enable / disable this feature based on the type of incoming call as shown on the side (see section Setting Call Actions). As soon as the user responds with any device, the others will stop ringing. During a conversation you can switch the management of the call audio from one device to another of those available to the user: for example, between your desk phone and mobile. To do this, you can press the toggle button in the current call box and select the desired device. At the time of selection, the PBX will send the call to this device which will ring accordingly; at that point, you can answer and the call will be passed onto the new device, leaving the old one. In the transition phase, the audio will not be stopped and the interlocutor will not notice the device change.